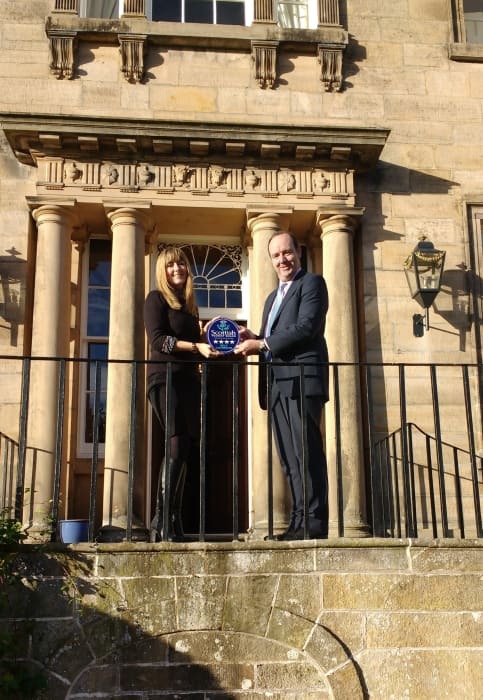 EDINBURGH, Scotland, 2016-Dec-23 — /Travel PR News/ — An historic family home near Forres has received a four-star award from VisitScotland at the very first attempt. Dalvey House, the Georgian home of the MacLeod family for over 250 years, was given the accolade from the national tourism organisation’s Quality Assurance (QA) scheme in recognition of its excellent quality. Owner Alastair MacLeod began offering luxury self-catering accommodation in September 2014. His family home offers comfort combined with practical living in a wonderful, Georgian setting. With nine bedrooms, the house can cater up to 18 guests and offers a number of other rooms for dining, socialising and relaxation. Situated within 17-acres of lawn and mature Georgian gardens, Dalvey is the perfect location for both intimate gatherings as well as large-scale events. The timing of the 18th-century mansion’s QA award is particularly apt as Scotland gears up to celebrate the year of History, Heritage and Archaeology in 2017. VisitScotland star awards are indicators of quality and provide reassurance to visitors. The national tourism organisation offers support to businesses to ensure they meet and exceed the high standards expected by visitors. The Year of Innovation, Architecture and Design started on 1 January 2016 and will end on 31 December 2016.It will build on the momentum generated by the 2015 Year of Food and Drink as well as previous years including Homecoming Scotland 2014, the Year of Creative and the Year of Natural. The Year of Innovation, Architecture and Design is a Scottish Government initiative being led by VisitScotland, and supported by a variety of partners including Creative Scotland, Architecture + Design Scotland, Scottish Tourism Alliance, Scottish Enterprise, The National Trust for Scotland, Historic Environment Scotland, Highlands and Islands Enterprise and The Royal Incorporation of Architects in Scotland (RIAS). The Year of Innovation, Architecture and Design is supported by £570,000 of Scottish Government funding. This entry was posted in Hospitality, Hotels, Tourism, Travel, Travel Awards, Travel Management, Travel Services, Travelers and tagged Alastair MacLeod, Dalvey House, Jo Robinson, Kate Bonsall, VisitScotland. Bookmark the permalink.